- The play starts in a 2-1-1-2 formation. - Player 1 is the dodging attackman. Players 2 and 3 are the remaining attackman. - Player 6 is covered by a longstick. - Player 1 begins the play with a Dodge from the corner. - Player 5 cuts across the top of the box and sets a pick for player 6. - Player 4 follow player 5 and seals the back of 5’s defender. - Then 6 is going to have an open lane to cut. - Player 3 will set a pick on GLE for player 2 (when 1 begins the play). - Then player 3 will the roll to X (to support 1). - As player 1 dodge, player 6 is cutting down the wing looking for quick shot. - His second option (of player 1) is player 2 cutting of the GLE after the pick form player 3. - Player 5 is going to follow player 6 to support player 1. - Player 4 is going to find a skip lane in the top of the right corner of the box. 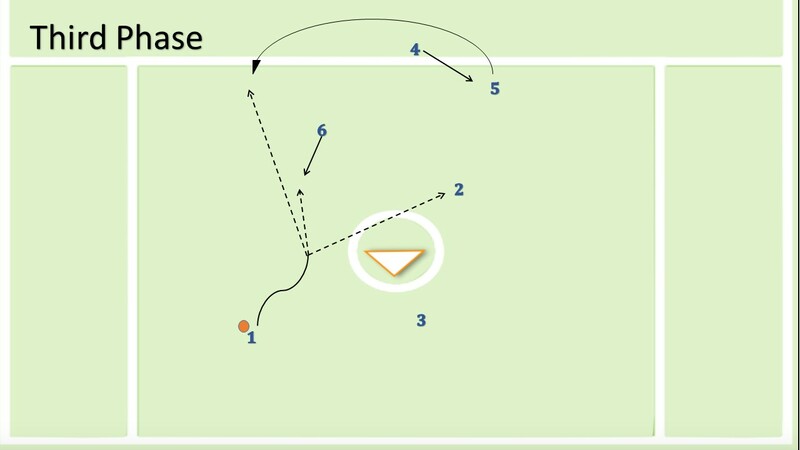 - Player 2 should be open in the right side of the goal, looking for a cross pass. - This Dodge Works great off end line or low sideline re-starts. - This Dodge needs a lot of space. - Run this from any corner of the field.